With its captivating blue color and soft sheen, turquoise makes a gorgeous engagement ring. You may not find a lot of turquoise options in your local jewelry shop, but don't let that stop you from purchasing the ring of your dreams. A nice selection of turquoise engagement rings, some also featuring diamonds, can be found online, in a range of styles and price points. You'll often find turquoise paired with sterling silver in southwestern jewelry, but there are also options featuring yellow and white gold. No matter which precious metal you choose, there are many beautiful styles to choose from. Turquoise looks beautiful as the focal point in your engagement ring, especially when the setting really draws the eye toward the blue gem. Sometimes, solitaires work well if you plan to continue wearing your engagement ring on your left hand after the wedding; however, in the case of turquoise the stone is usually set quite low in the ring to offer it some protection. You may need to purchase a custom ring wrap or move your engagement ring to your right hand to accommodate your wedding band. Sterling Silver Turquoise and White Topaz Ring - This solitaire from Amazon features a gorgeous oval turquoise, surrounded by a halo of white topaz all set in a sterling silver ring. This pretty engagement ring sells for just under $60. Turquoise Ring in Sterling Silver and Yellow Gold - The southwestern charm of turquoise and silver is displayed perfectly in this statement ring from Ross-Simons. 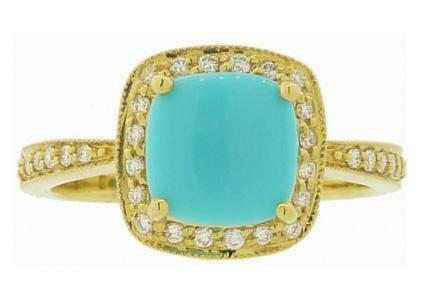 Featuring a large oval turquoise highlighted with silver and gold detailed settings, this ring commands attention. It retails for about $400. Sterling Silver Prong Set Turquoise Ring - This beautiful turquoise engagement ring from Melissa Joy Manning has a eight millimeter, prong-set turquoise slide in a dainty sterling silver band. This designer ring retails for about $190. In the case of engagement rings, a trend is to use the turquoise to enhance the shank of the ring and allow a diamond or cubic zirconia, or several central gems, to be the focal point. Setting the turquoise low like this offers it some protection, and this style sometimes works with wedding bands. Southwest Originals Turquoise and Diamond Ring - Southwest Originals makes each turquoise ring to order, so you can select from one of their many lovely designs. 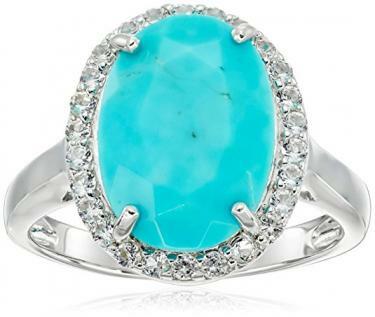 The turquoise and diamond ring, located near the bottom of the page, features a 0.25-carat diamond channel-set in a band of yellow or white gold inlaid with glowing turquoise. The ring retails for about $1,700 as shown, but you can customize this design. Low Profile Marquis Ring - This artist-crafted ring from Danny's Jewelry is so unique that it's sure to turn heads everywhere you go. It features a one-carat marquis-cut diamond as its central gem. The diamond is framed by a low white gold setting inlayed with bright blue turquoise. This handmade ring retails for about $6000. Diamonds can set off the beauty of the turquoise while still allowing this bright gem to be the engagement ring's focal point. Smaller diamond chips or pave-set diamonds add sparkle to the subtle glow of the turquoise. Since these rings feature a central turquoise, which usually has a low, protective setting, they may not work with a standard wedding band. White Gold Diamond and Turquoise Ring - This sweet ring from Amazon features a 2.3-carat central turquoise in an oval cabochon shape. It's flanked by three tiny diamonds on each side and is held securely in a 14k white gold band. This engagement ring retails for about $560. Turquoise and Diamond Ring - One larger two-carat turquoise is flanked by two one-carat turquoise gems and surrounded by a frame of diamond chips in this exceptional 14k yellow gold ring from Ross-Simons. This engagement ring makes a statement without being flashy. It retails for just over $500. Buying a ring featuring turquoise is a little different than buying your standard diamond solitaire. Keep these shopping tips in mind to make sure you get a lovely ring that is the real deal and will last for years to come. Turquoise has been a popular gem for thousands of years. As such, it's become quite rare. This means that you may encounter imitation turquoise gems, often made of plastic, resin, glass, or something called "reconstructed turquoise." Reconstructed turquoise doesn't include any real turquoise; it's made up of powdered minerals that are dyed to mimic the tones of the genuine gem. Some of these fakes may be easy to spot, especially plastic or resin forgeries that feel warm to the touch. Others may be more difficult. 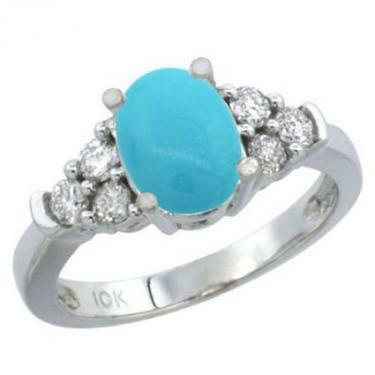 Make sure your ring is accompanied by a certificate of authenticity stating that it features genuine turquoise. According to the Gemological Institute of America (GIA), turquoise gems often undergo a variety of treatments designed to stabilize this fissure-prone stone. Other treatments may enhance the color. If you want a natural turquoise, inquire about these treatments and have a certified gemologist examine your engagement ring. The GIA reports that turquoise is only a five or a six on the Mohs Hardness Scale. For comparison, diamonds are a 10 and sapphires are a nine. This is a very important consideration when shopping for a turquoise engagement ring, since you'll want to wear it for years to come. The setting must be high enough and surround the stone well enough to protect it from bumps and scratches. Whether you love western engagement rings or simply want a ring that stands out from a crowd, turquoise is a great choice when set properly. Peruse the many options available online to find a ring that will be perfect for your lifestyle, budget, and personal taste.